This boat was 2 weeks per year since 1993. Original owner, prof maintained, stored indoors, cooler, bronze and stainless prop, Johnson Ocean runner 150HP V6. 84 gallon fuel capacity. Details = anchor, bilge pump, coast guard pack, compass, depthfinder, fishfinder, gps, hydraulic steering, live baitwell, rod holders, swim platform, 2 axle trailer, 2 batteries, vhf radio, documented, bow and stern lights. These are just the bare-boned description of this amazing boat. 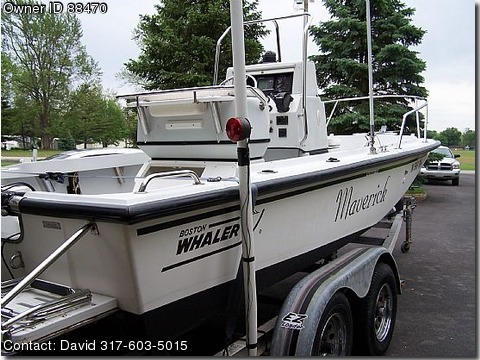 This is a perfect craft for a day out fishing, skiing/tubing or just for a cruise. USCG rating up to 7 passengers. It'll pull 2 skiers, 3 tubes, or fish wherever you want. Draft 18" to get into those secret spots or take 6 to 8 foot seas with ease. Comes fully equipped with Garmin GPSMAP 182C GPS, Lowrance X91 sonar fishfinder/depth sounder with HS-WST transducer. Uniden Solara DSC fixed-mount VHF marine 2-way radio. Johnson 150HP V6 Ocean-Runner outboard, complete with Full Service Manual. Operators manual comes with all components equipment. Outboard fully serviced and tunes in September of 2009. 8 adult USCG aapproved PFDs. 1 USCG approved throwable PFD. 2 small child USCG approved PFDs. Fitted anchor with 100 feet of 3/4" anchor line. 2 extra rod holders to mount to bow rail. Complete ski package with cable and full rope. Even comes with a bag full of assorted stainless hardware with nuts, bolts, washers, screws, and a wide assortment of various parts. Center Console and captain's bench canvas covers.